As Performance Week approaches quickly so does registration for the new dance season! 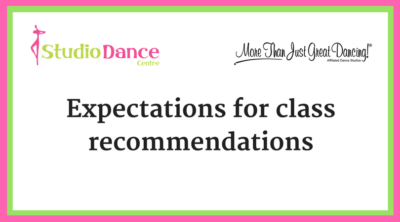 With class recommendations being emailed soon, we wanted to take a moment to remind our dance families about what that means, since class recommendations are made with many, many hours of consideration and deliberation! When selecting class recommendations for our Levels 1, 2, and 3 dancers, we are looking at which classes are the most developmentally appropriate based on a dancer’s age and peer group. When selecting class recommendations for Levels 4, 5, 6, and 7 dancers, we are looking at the skills your dancer was introduced to this year and evaluate whether those skills are still emerging, in development, or have been fully mastered. We also consider factors like class conduct, attitude, attendance, and which dance styles we think may suit your dancer’s personality. SDC offers 7 levels that cover our curriculum for ages 3-18, and it is expected for dancers to spend 2-3 years in a level before mastering the skills necessary for the next level. This is what we affectionately call the “grow and grind” in dance! As a parent, your encouragement to your dancer goes a long way towards a positive response with class recommendations. We believe a growth mindset can be nurtured in every dancer. We expect that dancers who have reached the goal of moving up a level will continue to be gracious and supportive of their peers, and that those who are not moving levels yet understand that they are still making progress and are very much valued. If we need to make any adjustments to class recommendations, we will do so based on what we see developmentally at the end of your dancer’s summer classes or after the new dance season has begun. We so appreciate all of the love and support you show your dancer! We are grateful to work alongside you to create an environment where every child can thrive.